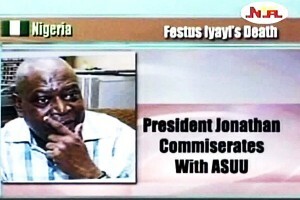 President Goodluck Jonathan commiserates with the leadership and members of the Academic Staff Union of Universities – ASUU, on the death of former ASUU President, Dr. Festus Iyayi. In a statement from Presidential Adviser on Media and Publicity, Reuben Abati, President Jonathan extends sincere condolences to Dr. Iyayi’s family, friends and Associates, joining them in mourning the renowned academic who also rose to National prominence with his courageous leadership of ASUU in the 1980s. The President expressed sadness that Dr. Iyayi lost his life while going to contribute to efforts to resolve the current ASUU strike. President Jonathan prays that God Almighty comforts all who mourn Dr. Iyayi and grant his soul eternal rest.